Past News and Events - M.O.R.E. UPDATE: Toys For Tots and Angel Tree items were distributed to more than 120 families. Prior Posting: Holiday Clearinghouse is a way of organizing the various community programs for the needy during Thanksgiving and Christmas. M.O.R.E. provides the names and addresses of clients who have signed up for one or more the programs. This year, M.C.H.S. H.O.S.A. Club (Health Occupations Students of America) will be providing Thanksgiving boxes of food for 50 clients and M.O.R.E. will provide the remaining. Christmas programs include food, Angel Tree and Toys For Tots. Zion Lutheran Church, through their “Love Project”, will provide food for 100 families and MORE will provide the remaining. The Angel Tree program provides a clothing gift for children through grade 8. This program is sponsored by a group of community members and the gifts are distributed at the M.O.R.E. Center. Toys For Tots is a program sponsored the Retired U.S. Marine Corp. and they are distributed to children through age 11. If you know persons in need of assistance from one or all of these programs, they must sign up before Thanksgiving. They should come to the M.O.R.E. Center during regular open hours. They should bring proof of residency (a bill or piece of mail with name and address) and they will be asked to complete an application. For Angel Tree and Toys For Tots, they will also be required to show proof of income, birth certificates for all children, and bring their children with them when signing up. They should also bring clothing sizes of their children. UPDATE: The M.O.R.E. Center collected $7,704 allowing us to supplement with milk, eggs, pies and numerous food items. Prior Posting: Holiday Food Boxes may be purchased for $15. The Northern Illinois Food Bank provides these boxes for half of their cost. This box includes a turkey and all the fixings for a typical holiday meal. The participating groups add extra food to these boxes to assure that each client is receiving enough food for the season. Checks for Holiday Boxes may be sent to M.O.R.E. at 829 Greenlee Street, Marengo, IL 60152. Any support that you can provide is greatly appreciated! The Little Portion is adding a small program that supplies school children with socks. Students will receive new socks at the same time backpacks are distributed. Our original building debt of $65,000 has been reduced to $27,500. Money raised this year has not yet been applied and it is hoped that next year we will be able to pay off all of our obligations. This is happening because of such a supportive community. Once the building debt is erased, any and all fund raisers will be applied directly toward helping those in need. UPDATE: The annual Fay’s Bar-b-q Dinner and Raffle on July 9 was enjoyed by over 600 people at Marengo High School. The dinner raised approximately $3,000 and the raffle brought in another $3,000. The proceeds from this event will be going toward the building debt. Prior Posting: The annual Fay’s Bar-B-Q Dinner Fundraiser is set for Friday, July 9. This event raises money to pay toward the debt owed on the building. Dinner is served from 4:30-7:00 p.m. at the Marengo High School cafeteria, 110 Franks Road. For $12, a dinner of pork chop, chicken and all the works is provided, including dessert. Tickets may be purchased from any Board member or call Sandy Butenschoen at 815-382-1815. A limited number of tickets may be purchased at the door. Take-out orders are provided. UPDATE: Blackstone Golf outing was again a success, with $2,724 being raised. Because of heavy rains, the outing was postponed to June 29. That day bought perfect weather. The proceeds will be going toward the building debt. Prior Posing: The annual Blackstone Golf Fundraiser is set for Tuesday, June 8. This event raises money to pay toward the debt owed on the building. A great time of golf begins at 12:00 p.m. sharp and foursomes are being formed now. Limited slots remain. The tickets are $100 per person. An electric cart with GPS to the hole, driving range and a bag lunch are included in the price. Call Sandy Butenschoen at 815-382-1815 for tickets and more information. Update: The M.O.R.E. Center was buzzing with activity on Saturday, March 6, with Cub and Boy Scouts scouring the community for food items to give to us. Thanks to Rodney Rote and Bill Brosch for their leadership and to all the parents helping out with canvassing the neighborhoods and then sorting the food. The scouts collected over 17000 items weighing more than 7300 pounds. This amounts to about 35% of our annual contributions of food. The scouts have been helping the needy with food drives each year for about 13 years and each year the enthusiasm is outstanding. Thanks scouts. The plans are in the works for the annual “Scouting For Food” drive. Saturday, March 6, is the day set aside in Marengo and Union for residents to set out food at the curb for area scouts (and parents) to pick up. MORE recognizes this scout drive as our largest annual food drive by organizations and we are thankful for their help. The M.O.R.E. Center takes pride in being more than a food pantry. When people need assistance, of course food is a priority, but housing, utilities, clothing and household items are also important to a family’s well being. One of our services is called “Little Portion,” where we provide clothing and small household items. The program is headed by Deb Keane and a small army of volunteers. Because our multi-purpose room is being used more often and our storage space is limited, this program is making some changes. Our new approach is to accept items that will be helpful to a person or family in immediate need. We will accept “in season” items and clothing only. We will also accept household items necessary for a small apartment that are functional. Examples are dishes, utensils, pots and pans, small appliances, serving bowls, small clocks, radios, towels, sheets, blankets, etc. We cannot accept large furniture and appliances, knick knacks, etc. In the past, we have accepted and passed on most garage sale leftovers. When items are simply dropped off, we are forced to find ways to dispose of them. Not only is this a huge problem to sort through, but it isn’t what we are about. We accept items during regular hours, from the list above, so left over garage sale items are generally not wanted. Can you help us to pass on the word about our new policy? Our volunteers need everyone’s cooperation. During our annual meeting in January, our Board of Directors celebrated the past year of M.O.R.E. and we took a look back at the year 2009. The overall conclusion was that it was an “amazing” year of accomplishments, especially in the food pantry program. The food pantry gained quite a large number of pieces of equipment, including a walk-in freezer, commercial shelving, commercial refrigerator, and computers for client processing and tracking. As you might guess, this required a large amount of funding, and that was acquired by generous donations and grants. Speaking of funding, the emergency financial assistance program also did well, with more than $15000 being expended to help with rent and utilities to keep families in their homes. Donations of cash are often a barometer of the health of a charity, but in our case, food donations are just as important. We measure our food donations and purchases by weight. In 2009, we processed more than 155,000 pounds of food and related products. And this does not include the food that is distributed by the M.C.H.S. Health Occupations club at Thanksgiving and the Zion Lutheran Church Love Project at Christmas. Combined, both of those programs directly affect more than 150 families. This is a breakdown of how we received our food in measurement of pounds. Churches . . . . . . . . . . . . . . . . . . . . . . . . . . . . . . . . .9046.5 lbs. Schools . . . . . .. . . . . . . . . . . . . . . . . . . . . . . . . . . . 1608.4 lbs. Club or Organizations . . . . . . . . . . . . . . . . . . . . . . . .2315.4 lbs. Businesses & Government	. . . . . . . . . . . . . . . . . . . 15702.1 lbs. Individuals	. . . . . . . . . . . . . . . . . . . . . . . . . . . . . . . 10876.6 lbs. Northern Illinois Food Bank Purchases . . . . . . . . . . .27010.0 lbs. Northern Illinois Food Bank Commodities . . . . . . . . . 48667.7 lbs. NIFB Mobile Market Trucks . . . . . . . . . . . . . . . . . . .23531.0 lbs. Whether we receive money or direct donations of food, the bottom line is that our Marengo/Union community works mightily to help struggling families. So, our Board thanks you with all their hearts for that “amazing” year. On August 4, the M.O.R.E. Center was filled with children waiting anxiously to get their new backpacks filled with school supplies. 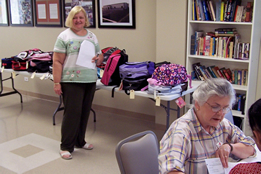 The backpack program is provided by the Salvation Army and distribution is through our Salvation Army Extension Service Coordinator, Mary Ann Kawall. This year, more than 100 backpacks were distributed. M.O.R.E. will help to supply children that come in later. Yeah, back to school. When children came in for backpacks, their parents received $25 vouchers for gym shoes or gym clothes to be purchased at Levin's Shoes & Dry Goods in downtown Marengo. This program is sponsored by M.O.R.E. and handled through our financial assistance program. The Blackstone golf fundraiser on June 9 and the Fay's Bar-B-Q & Raffle on July 10 raised about $12,000 that will be applied to the building mortgage. M.O.R.E. wishes to thank all those attending these events and the many, many individuals helping to make them successful. The building loan is expected to be paid in full in 2 or 3 years. Then the burden will be lifted and we can focus any fundraisers directly upon serving those in need. The M.O.R.E. Center is always looking for ways to make visits by clients a positive and safe experience. Volunteers had a chance on August 4, to listen to experts discuss workplace safety while learning ways to deal with upset or threatening clients. Bernie Banahan, past Vice President/Director of Global Security & Loss Prevention for Motorola spoke to the 90 attendees about violence in the workplace, its impact on business, and violence prevention strategies. Leonetta Rizzi, Manager of McHenry County Crisis Services, spoke about identifying basic behaviors and applying specific interventions at each level of behavior. She also gave an overview of Crisis Services. The morning wrapped up with a panel consisting of Ed Rickert from Mental Health Service, Marengo Police, Fire, Rescue, and the two featured speakers. The audience participated with questions and comments. The overall feeling about the seminar was that it was informative and thought provoking. Here at the M.O.R.E. Center we will be assessing our approaches to working with clients and our responses to difficult situations. The seminar was hosted by M.O.R.E., Marengo-Union Chamber of Commerce, Districts 154 and 165 and the Marengo Police. Fay's B-B-Q Pork Chop and Chicken Dinner will be coming Friday, July 10. This fundraiser has been extremely popular, because the food is excellent, reasonably priced and simply a great way to help M.O.R.E. raise money to pay down its debts. Tickets may be purchased for $11 (including dessert) from any Board member or at the door. A raffle will also be held that evening. The cost is $50 per ticket, but the pay-out is big. Prizes are 1-$500, 1-$1000 and 1-$1500. Tickets for both events may be purchased from any Board member. Our annual golf outing fundraiser will be Tuesday, June 9, beginning at noon. How about getting a foursome together and help us meet our building debt obligations at the same time. See any Board member for details, or call Sandy Butenschoen at (815) 382-1815. That's just what we are doing. The M.O.R.E. Center now has ultra-violet light and HEPA filtration on the air ducts. The air turns over 6 times each hour insuring that it will be as bacteria-free as possible. We also have purchased two HEPA room air filters for the offices. This is in response to the concerns that stale air may possibly be spreading germs and viruses throughout the building. On Saturday, May 9, Marengo and Union Post Offices worked together in collecting over 3300 pounds of food items. This is a 32 percent increase over last year. Thanks postal workers and thanks Girl Scouts in helping to pick up and sort. UPDATE: Thanks to a caring community and the hard work of many, many people, this year's Scout drive was very well done. Even though that morning was very rainy, over 16,000 items, representing over 7,600 pounds, and more than $1,400 was collected. The children and adults made the work look like a fine-tuned machine with the youngest providing empty boxes to the tables and the oldest providing the muscle in the store room. M.O.R.E. wants to thank the following: Cub Scout Packs, 163, 355, 412; Boy Scout Troop 163; Venture Crew 530; Girl Scouts and Marengo Middle School Eighth Graders. Also, a special thank you goes to Suzanne Jones for providing countless hours in preparation and follow-up. Prior Posting: The Boy Scouts will be delivering bags to local homes on Saturday, February 28 for the annual "Scouting For Food" food drive scheduled for Saturday, March 7. Citizens are asked to donate non-perishable food and personal items to help those in need in our community. Scouts will be out Saturday morning to pick up food bags. M.O.R.E. counts on this annual drive for about one-third of its annual inventory. UPDATE: M.O.R.E. Center is now the proud owner of a much needed walk-in freezer. Over the past two months, volunteers have helped assemble the 8’ x 8’ freezer from Panda Hut and the installers have made it come to life. In the long run, the walk-in will be cost efficient over the five chest freezers we will be replacing. Also, our new arrangement should be easier for volunteers transfer products. The freezer was purchased in part by grants from Jewel-Osco, Wal-mart, individuals and a private grant. Prior Posting: We got it! We can breathe now. Jewel-Osco Food Stores has given M.O.R.E. a grant of $2500 to be used toward the purchase of a walk-in freezer. In addition to this, $1000 from Wal-mart, $2500 from a private foundation grant, and many individual donations are making our much needed walk-in freezer possible sometime in February. This year, food boxes, including a turkey, were available for $15 from the Northern Illinois Food Bank. A community drive brought in more than $6000 for food boxes. This enabled M.O.R.E. to add to the boxes with milk, eggs, cheese, ham and a number of canned and boxed foods. In partnership with the HOSA organization at MCHS, Thanksgiving food boxes were distributed to more than 130 families. Zion Lutheran School and Church provided 114 Love Gift food boxes and M.O.R.E. provided 125. The Marine Corps Toys For Tots packing and distribution was handled at the M.O.R.E. Center on the week-end of December 20. It was amazing to see students from the various Marengo schools attack the mountain of toys and made short order out of chaos. Sunday the 21st was bitterly cold and flexibility was necessary to bring our clients indoors in the very cramped isles of toys and gifts. In all, 167 families, almost 400 kids, received toys from the program. Thanks Marines! At the same time, gifts from the Angel Tree program were also distributed at the M.O.R.E. Center. These gifts of clothing, solicited by a group of local business people and under the direction of Leslie Pace, went to 153 appreciative families. LEVIN'S, A PROVEN FRIEND OF M.O.R.E. 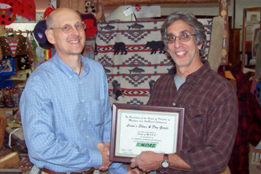 Levin’s Shoes and Dry Goods was honored with a plaque for being a Friend of MORE. Bob Levin accepted a plaque from President Charlie Petrausksis for the sponsoring of a back to school gym shoe and gym clothes program back in August of 2008. MORE is appreciative of businesses such as Levin’s for continuing to support our causes. Thanks to a local anonymous business, our gas and electric bills are being paid each month. As you probably know, some of the winter bills get to be quite large. The stress of meeting those obligations has been taken away from us and the Board of Directors is grateful for this Friend of M.O.R.E. September 17 marked the date of our volunteer celebration and recognition. M.O.R.E. has more than 120 volunteers working together to make all the wheels turn. The luncheon was hosted by the Board of Directors and the M.O.R.E. Center directors. Bob Botts shared accomplishments, concerns and statistics for the past year as well as future plans. The M.O.R.E. Center was abuzz on Monday, August 11, with 88 children receiving back packs and school supplies. Thanks to the Salvation Army and local donations, our neediest children will be starting school with most of the classroom supplies requested by the schools and they get to carry them in style. Mary Ann Kawall, our Salvation Army Extension Director, and Chris Botts were delighted in watching the excited children waiting to receive their supplies, including tooth brushes. The children’s parents also received a M.O.R.E. voucher of twenty-five dollars to Levin’s Shoes and Dry Goods. The voucher is to be used for the purchase of gym shoes or gym clothes. Thanks Bob Levin. All of us at the M.O.R.E. Center want to thank the Salvation Army volunteers, Prairie Community Bank, Levin’s, and many citizens for their participation in our back to school program. Two very special young ladies, Ellen Borhart and Katharine Shadle, sponsored a 5K run/walk on Saturday, July 12. A total of 107 participants crossed the finish line on that beautiful morning which followed a torrential storm the night before. Ellen and Katharine were outstanding with the careful planning and implementation of the event. As part of their Girl Scout program, they worked with city officials and many volunteers. Each participant brought at least two food related items for M.O.R.E. and received a shirt commemorating the day. The Board of Directors of M.O.R.E. wishes to express our thanks, not only to Ellen and Katharine, but also to the numerous sponsors, city council, Marengo police, Marengo-Union Rescue Squad, and the many volunteers stepping forward and making the event a total success. Most, if not all, of the runners or walkers had a great time, and M.O.R.E. received 573 pounds of food items to help in stocking the shelves. 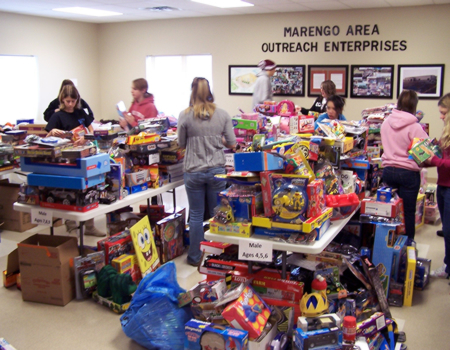 Marengo area OutReach Enterprises (M.O.R.E.) has been very active during the last two months raising funds to lower the debt of the M.O.R.E. Center. The most recent venture was the Fay's Barbeque Pork Chop and Chicken dinner held at M.C.H.S. on July 11. 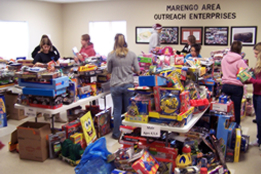 Thanks to the generous support of the Marengo-Union community, M.O.R.E. raised about $10,000 with the dinner, raffle and golf outing which will put us ahead of schedule concerning the mortgage. We especially want to thank Norenne Dunker and her mighty army of volunteers and extended family. Thank you also to M.C.H.S., Dean Worrell, our Board of Directors and the many individuals stepping forward to help. The May 10th U.S.P.S. food drive brought in near record amounts of food. This year, most routes were covered and the results were 2,500 pounds. 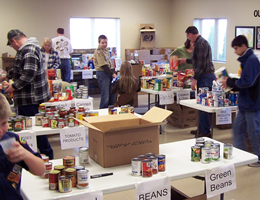 The annual Scouting For Food drive was held on March 1. A "complete success" is the best way to sum up the results. With over 100 volunteers stapling bags, driving routes, sorting, counting, weighing and stacking food, cooking lunch, and then cleaning up, this facility was buzzing. The food pantry is stuffed with over 15,000 items weighing more than 12,000 pounds. The M.O.R.E. Center food pantry counts on the scout drive to provide about half of the annual food. We want to thank the leaders for their spirited dedication to our cause and, of course, the scouts. The day that the M.O.R.E. Center opened, we went from a small pantry with a few volunteers to an agency of more than 40 volunteers. We have been flying by the seat of our pants for six months, learning what works and what does not work. On February 27, the volunteers met to formally be indoctrinated into the M.O.R.E. Center procedures. They received a Volunteers Manual and listened to Bob Botts and their program directors explain the importance of confidentiality, punctuality, dignity and respect, safety and specific functions relating to their area. Volunteers also were able to share ideas and problem solve. We hope to continue meeting about twice a year. View the Volunteer Page to learn more about volunteering at M.O.R.E.